Geneva - Around 60 million people across sub-Saharan Africa are already going hungry and the situation could deteriorate dramatically as climate phenomena hike the risk of drought, the Red Cross said on Monday. The International Federation of Red Cross and Red Crescent Societies (IFRC) warned that a series of climatic shocks in 2014 and 2015 had decimated harvests and left many people in Gambia, Mauritania, Malawi, Namibia, Senegal and Zimbabwe dependent on food aid to survive. 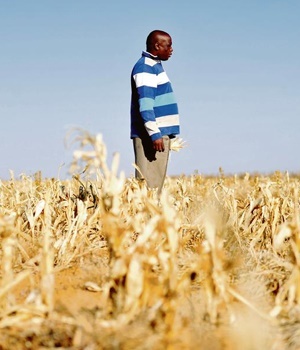 Floods and drought had dramatically reduced maize production, the regional staple, in southern Africa, while the region was also hit by erratic rainfall, failed crops and violence. Yet the worst is yet to come, IFRC warned, pointing to the strengthening of the El Nino climate phenomenon, which comes with warming sea surface temperatures in the equatorial Pacific, causing heavy rains in some parts of the world and drought elsewhere. "The Red Cross Red Crescent Climate Centre predicts a higher likelihood of flood conditions developing in equatorial Africa, and increased risk of drought in parts of southern Africa and the Sahel region," it said. "Many families are surviving on one meal a day made from leaves, which have very little nutritional value. Or, they are even going without food for days because of the erratic rainfall," Miriam Grove, IFRC operations manager in the Sahel region, said in the statement. "These people need urgent assistance," she said, adding that "if we can help them now, we can maintain their nutritional status and give them the tools and seeds necessary to survive worsening conditions next year." The organisation warned that without more aid to the region, "the prospect for many affected people is bleak." Michael Charles, IFRC acting regional representative in southern Africa, acknowledged that "the regularity with which we see food insecurity in Africa has left many people apathetic." "But the crisis currently facing millions of families is not inevitable and should not be acceptable," he said, insisting "there are many things that we can do to stop this food crisis in its tracks and alleviate the impact on vulnerable people, but we need international support to make this happen." Malnutrition is already high in region, with the UN children's agency reporting that a full 37% of children there are stunted - a clear indication of long-term nutritional problems. "Further decreases in the availability of nutritious food may be life-threatening for children, people living with HIV, and other vulnerable groups," IFRC warned. The organisation said it needed around eight million Swiss francs ($8.1m) to provide 205 000 of the most vulnerable people across six countries with urgently needed food aid and help equip their communities to withstand further climatic shocks.